What is the salary for the Technician role at U.S. Advisory Commission on Public Diplomacy? How much do professionals with the title Technician make at U.S. Advisory Commission on Public Diplomacy [JB emphasis]? The average salary for the role of Technician at U.S. Advisory Commission on Public Diplomacy in Washington D.C. Metro Area is $57,700. This salary estimate is based on salaries at similar companies submitted by LinkedIn members who have the title “Technician” in Washington D.C. Metro Area. Journalism, Communication, Mass Communication, etc. • Arts & Humanities includes: English, History, etc. • Professional Degree includes: Business, Finance, etc. Science, Sociology, Gender Studies, etc. SIMFEROPOL (Sputnik) - A delegation from Norway will arrive on Sunday to Russia's Crimea with a six-day visit, during which it will travel around the peninsula and hold meetings with Crimean lawmakers and public figures, Yuri Gempel, the head of the Crimean parliament's committee on international relations, told Sputnik. The visit of the delegation, which includes public figures, representatives of academia, agriculture and entrepreneurship, will last through October 6. "The delegation from Norway arrives in Crimea on Sunday morning. We have close business ties with the Norwegians in the framework of the public diplomacy [JB emphasis] project. This visit is important as we are breaking the information blockade in Norway. The delegation includes practically representatives of all parties that exist in Norway. They are not just citizens, they are public figures, including members of various parties," Gempel said. The delegation is expected to visit Yalta, Sevastopol, Simferopol, Bakhchysarai and a number of local sights as well as to hold a meeting with Crimean parliament chairman Vladimir Konstantinov. 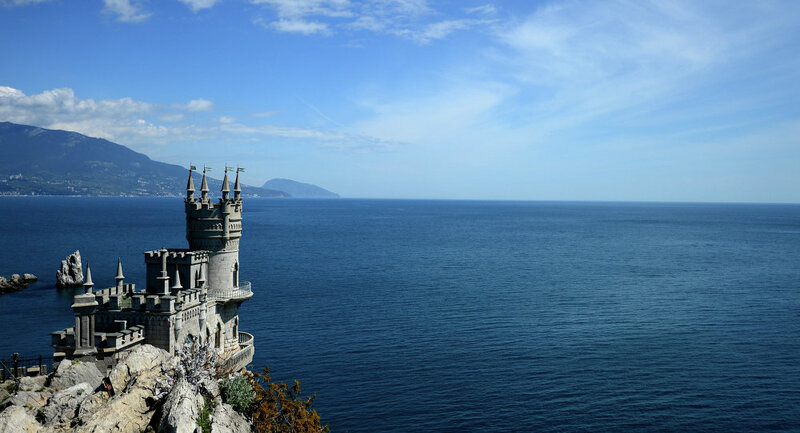 Delegations from a number of countries, including France, Germany, Italy and Bulgaria have also visited the peninsula despite sanctions imposed on Moscow following the 2014 referendum on Crimea rejoining Russia. Harriet Elam-Thomas, a former U.S. ambassador, spoke at SU on Wednesday. 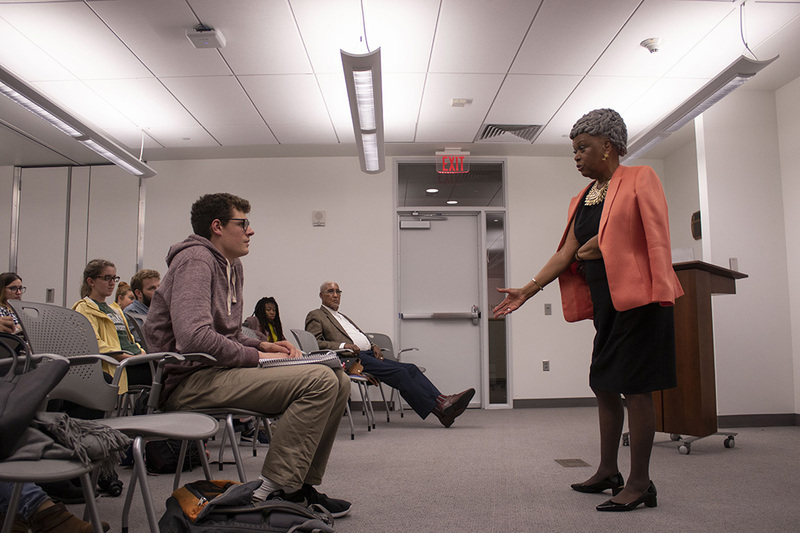 Before Harriet Elam-Thomas [JB - see] began speaking at Syracuse University on Wednesday, she shook hands with people in attendance. “Happy to meet you,” the retired U.S. ambassador told attendees while asking about the origins of their names as she learned them. One of the essential tools that Elam-Thomas said she learned during her more than 30-year career with the country’s foreign service: creating relationships with people that are based on civility, respect and sincerity. She discussed effective communication skills with an audience of about 30 people at the S.I. Newhouse School of Public Communications’ I3 Center. The event, co-sponsored by Newhouse and the Maxwell School of Citizenship and Public Affairs, was part of Elam-Thomas’ conversation series called “Civility Strategies: Healing Approaches That Unite People and Strengthen Democracy.” The lectures are meant to focus on uniting across lines of race, gender, religion, sexual orientation and political affiliation, according to an SU News release. Elam-Thomas, who is now the director of the diplomacy program at the University of Central Florida, has worked in Senegal, Belgium, Greece and Turkey. Elam-Thomas said she has had to navigate many customs that weren’t characteristic to Western civilization while working around the world. She told the audience she learned two languages — Greek and Turkish — in her 40s. Speaking someone’s native language with them in another country makes a huge difference when interacting with others, she said. It’s a way to give honor to someone’s culture and history, she added. It also enables a speaker to communicate in a way that feels more familiar and less threatening to a subject, she said. Public diplomacy [JB emphasis] officers have a harder job today than they did when she first entered the foreign service in 1963, she said. With a 24-hour news cycle that can be known to cause “information overload,” she said, people already think they know what’s going on both in the U.S. and around the world. Communicating through social media is only as effective as the people using it, she said, and that involves being extremely sensitive about the way a message is being delivered and how it will be received culturally by its intended audience. “You have to get in the heads of your audience,” she said. Most effective dialogue, she added, requires careful listening. She encourages her students to listen more and speak less. The Attorney General’s question sparked discussion beyond the cabinet meeting. An Editorial Note posted on the State Department Historian’s website was written about 1987, based on the publication date of the volume of the Foreign Relations of the United States, 1955-1957 (Volume IX, “Foreign Economic Policy; Foreign Information Program”), this note appears in. This Editorial Note came to my attention because of what it suggests: that the Eisenhower Administration considered abolishing USIA in 1957, barely four years after creating it. The Historian’s over three-decade-old Editorial Note requires context. The following four points, three of which begins with a passage from the Editorial Note, provide the background I believe is necessary to understand the commentary better. The United States has earmarked more than $1 billion to combat disinformation, propaganda and countering the spread of terrorism ideologies online, the Department of State has said. Jonathan Henick, the acting deputy coordinator of the Global Engagement Centre (GEC), told a group of international journalists on Wednesday at the Foreign Press Centre in Washington DC that the US government has decided to redouble its efforts towards thwarting the spread of disinformation. The GEC is the arm of the Department of State primarily responsible for coordinating America’s response to the spread of disinformation. “Counter-disinformation efforts, programmes, grants, financial support to fact-checking organisations, other civil society organisations, if we adopt that definition, the United States spend(s) probably over a billion dollar a year to counter disinformation,” he said. “The Global Engagement Centre itself this year has only a budget of $85- 90 million to counter state and non-state disinformation but that doesn’t include our normal development programmes. “It doesn’t include investments by US military, normal exchange programme that we do, public diplomacy [JB emphasis] and a lot of other things that we do that are used to counter disinformation,” he added. Mr Henick, who defined disinformation as the deliberate spread of “information that is knowingly false with the intent to deceive the audience,” said those he described as “malign actors” have taken advantage of the rapid change in technology, communication and how news is consumed to spread their nefarious interest. He, therefore, said the GEC has to come up with a robust approach to countering the spread of this toxic mix of disinformation. He admitted that the United States may have been complacent for a while, especially after the Cold War, but has now realised that it has to do more in the area of counter-disinformation. According to him part of this robust approach includes working with the media, civil society organisations, governments, and the public to “increase resiliency to make people understand that they are venerable [sic] to misinformation and disinformation. “To do what we can to make it difficult for our adversaries to take advantage of the situation,” he said. Mr Henick added that the United State is adopting an all-encompassing approach to battling the spread of disinformation and not just limiting it to the work his organisation is doing. According to him, the GEC is not the only part of the US government doing this work. “This is work that is done every day domestically in the United State by state governments, local governments, by agencies here and certainly done on behalf of the US government overseas in all of our embassies, our ambassadors, our press attaches, development partners who are working on programmes to strengthen the media, even our military colleges who are trying to develop relationships with the media and communicate accurately what our military policies as well. “This is a collective effort. What the GEC was empowered to do was to try to coordinate those effort to better understand disinformation, who our adversaries are, what their tactics are, to do a better job of supporting like-minded government and civil society and media partner all around the world to help expose and counter disinformation. “We are also investing very heavily in science and technology and data analytics, we are working with private sector technology companies to identify new tools, new software that will help us to better grapple with this challenge,” he said. Mr Henick said the US government is adopting a similar approach to countering the spread of terrorism ideologies by groups such as ISIS and Boko Haram. He, however, acknowledged that there are no quick fixes to the problem. According to him, a robust and continuous countering to the spread of violent extremism ideologies seem to be the best way to tackling the problem. “There (are) some similarities between the tactics they have been adopted by terrorist groups and the tactics that have used by foreign state actors. There are no quick easy solutions to these problems. It is not like we can flip a switch and deny them access to the TV or radio or internet access. “We can shut down individual accounts and we see them pop up as quickly as we shut them down,” he said. “One of the things we are doing is to work with the big social media platforms to try to automate their ability to detect these types of terrorist disinformation and be able to take down some of these contents as soon as possible. “But in the long run, it’s going to require more traditional means of working with responsible media organisations, working with civil society organisations. “Just because somebody is consuming radical ideological information online, that is not a crime in itself, but in a lot of countries there is no social support system such as religious figures, counselors at school. “Parents are faced with the choice of reporting their own children to law enforcement authorities,” he said. Despite the expression of doubt by the president Donald Trump, US intelligence agencies have said that Russia disrupted the 2016 presidential election and is still trying to disrupt the mid-term elections in the country through the spread of disinformation and certain propaganda. MANILA — The European Union (EU) will hold the 2018 European Higher Education Fair (EHEF) at the Shangri-La Plaza on Oct. 10 for Filipinos who want to pursue studies in any of the bloc’s member states. This year’s theme, “Sustaining Innovation and Excellence”, continues to promote EU as an outstanding center of quality in higher education. During EHEF 2018’s press launch on Thursday, EU Ambassador Franz Jessen stressed that education is one of the priority areas of cooperation between the EU and the Philippines in the bilateral Partnership and Cooperation Agreement. “Higher education however needs to take into account changing technology and internationalization to provide students with the right skills and qualifications,” he pointed out. “We hope that the European Higher Education Fair 2018 will pave the way for Filipino youth to have better access to information about the EU higher educational systems,” he added. This year’s EHEF will feature 32 HEIs from Belgium, Czech Republic, Denmark, France, Germany, Hungary, Italy, Netherlands, Spain, Sweden, and the United Kingdom. China has strongly rejected on Friday the united nations as “blackmail” on the trade and taken out of the United States of Donald Trump on most of the major folders, while denying they want to dethrone on the world stage. “China will not accept the blackmail and will not be the object of pressure,” warned foreign Affairs minister Wang Yi at the forum of the annual general Meeting, without directly appoint his opponent. In the midst of war commercial with shots of customs duty with Washington, the head of china’s public diplomacy [JB emphasis] has delivered what looked like a lesson of free trade is intended, so as to barely veiled, to the Americans. “Protectionism will only bring harm to all”, has he hammered. He also asked Beijing as a “champion of multilateralism” at the time the administration Trump is criticized for its approach of unilateralism of the affairs of the world. At this same rostrum, the president of the United States had defended Tuesday its vision of international relations based on the “sovereignty” of nations, in denouncing “the ideology of globalism” and targeting several multilateral organizations. “China has always advocated the international order” and “respected” the decisions that are made, replied Wang Yi. The head of china’s public diplomacy has once again defended the agreement for 2015 on iran’s nuclear ambitions, which the United States withdrew in may to the chagrin of the other great powers. On North Korea, he once again pleaded for the UN to “create favourable conditions”, to encourage denuclearization. The day before, he had called on the security Council to ease sanctions, dismissing the appeal in the u.s. to their application to “strict” until the nuclear disarmament of the regime recluse is completed. His plea seemed to oppose frontally the first two economic powers of the planet. It resonates in a special way at the time when Donald Trump, who had wagered since his arrival at the White House in early 2017 on its relationship with the chinese president, ruled this week that Xi Jinping was “perhaps more” his “friend”. On a backdrop of trade tensions, the billionaire republican and his administration have multiplied the fronts, in what looks like an all-out offensive to falter Beijing: denunciation of the internment of muslim uighurs, sanctions against the purchase of Russian weapons, suspicion of violation of the sanctions north Korean. And even a surprising attack of Donald Trump himself, at the security Council, against presumed interference by the chinese in the next parliamentary elections the u.s., the objective of which would be his own defeat. Despite this climate, explosive, Wang Yi assured, at a conference in New York, as fears of a China that would seek to dethrone the United States on the world stage were “unfounded”. Referring to the idea in force after him in some western intellectuals, according to which Beijing would multiply the efforts to achieve a “hegemonic position, or even challenge the United States leadership”, he said: “I want to tell you very clearly that it is a strategic error of judgement serious”. “It is a prediction wrong, which may be extremely detrimental to american interests and to the future of the United States,” has also warned the chinese minister, anxious of seeing a vicious circle fed by “new suspicions”. In recent years, China has significantly expanded its influence in Africa in particular. Has the UN, it also takes more and more place, engaging in still more military in peace operations – 2.500 today deployed, including Mali, the democratic Republic of the Congo, in South Sudan or the Lebanon – and also increasing its contributions regularly financial. At the Council on Foreign Relations, a think-tank in New York, Wang Yi has also denied any looting chinese of technologies developed by foreign companies, as is regularly accused China. “I want to emphasize that China has not copied the foreign patents” and “will not copy foreign patents”, he assured. 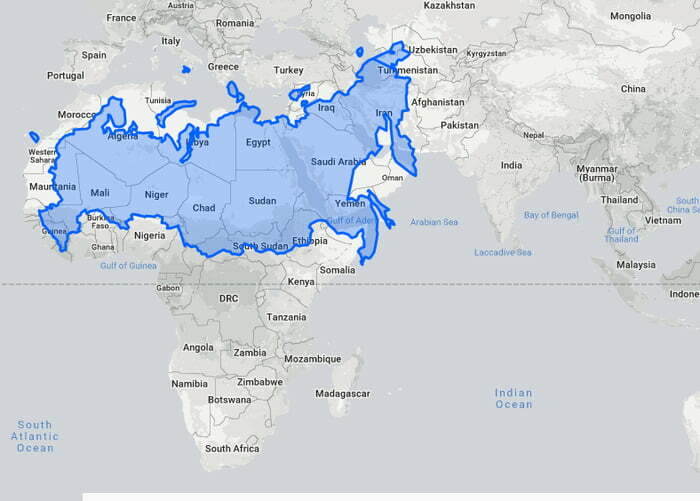 Image (not from article) under the caption: The true size of Africa observed by overlapping Russia. Russkiy Mir Foundation, [...] a non-government and non-profit organization, has created a number of initiatives aimed at strengthening the Russian language and promoting the country’s culture could possibly be one way to improve overall image abroad including Africa. Russian authorities are really struggling to find effective ways of marketing the country's language abroad by establishing regional language centers exactly similar to those that were closed in African, Asian and Latin American countries after the collapse of the Soviet Union in 1991. Professor Georgy Toloraya, the regional director for Asia and Africa Department at Russkiy Mir Foundation, said in an interview with The Exchange that "both Asian and African countries are strong priority regions, much attention is devoted to these regions so that they can benefit from some of the cultural programs and as a way of strengthening Russia's cultural influence abroad." "In our country, the president and the government pay attention to the development of the Russian language. This work involves the media, as a matter of fact, and in a broad sense, the cultural and scientific institutions that are potentially useful as conduits for promoting the Russian language and culture are under serious consideration," he said. Toloraya said: "conducive to strengthening the position of the language generally and the influence of Russian culture is the practice of holding the Year of Russian Culture in foreign countries, which with our partners, we organize on regular basis. We expect that interested African educational and cultural experts will share their valuable assessments and suggestions that will help us outline further comprehensive actions." In the next few years, Russia plans the opening of Russkiy Cabinets in selected African countries where they are currently unavailable and strive to activate the existing centers. There are about 10 Russkiy Cabinets, (for instance in Morocco, Egypt and South Africa) currently operating in Africa. Modelled as Confucius Institute, British Council or Alliance Française, Russkiy Mir primarily promotes the teaching of the Russian language within Russia and abroad - both to new learners of the language and to those who already know and love the Russian language, and further wish to recapture or maintain its fluency. The means of the language studies include funding scholarship on its linguistic origins, creating new standards for language instruction, producing educational materials, and sponsoring language courses, competitions, and other educational programs. Currently, one of the most widespread forms of Russian studies in Africa, for example, is the creation and functioning of what is popularly referred to as Russkiy Cabinet. The Russkiy Mir Foundation supports the creation of Russkiy Cabinets via the provision of a contract-based donation to the hosting organization. This process begins with an official request from the potential host organization or institution about the creation of the Russkiy Cabinet. If the Foundation approves the organization's request, the two parties then sign a donation agreement that specifies, in necessary details, the materials to be provided, mostly free of charge, by the Foundation. In turn, the host organization is obliged to use the materials for educational purposes with the aim of popularizing the Russian language and supporting intercultural dialogue. But, experts have suggested that other aspects of the soft power and public diplomacy [JB emphasis] have been missing on the policy agenda and needed to be pursued with African countries. Naftali Mwaura Muigai, an expert on Social Communication and Cultural Policy in Nairobi, has explained: "Russia appears quite removed from cultural policy issues. We don't have vibrant Russian cultural centers in many African cities hence the low uptake of the language." Likewise, there are limited scholarship opportunities for African youth to study in Russia. Nowadays, China is being viewed as a strong strategic partner in Africa given its (China's) strong footprint in diverse areas such as commerce, culture, and technology transfer, Naftali Muigai pointed out further in an emailed interview with The Exchange. In a similar argument, Ojijo Pascal, an experienced corporate lawyer and guest lecturer based in Kampala, observes that "the Russian government does not carry out Russian cultural events, there are no visible Russian cultural centers as compared with the French cultural and German cultural centers. "There is a huge cultural gap of new thinking, working with young professionals and associations to promote people-to-people diplomacy through business links, cultural exchanges, and competitions," Ojijo told The Exchange. On his part, Albert Khamatshin, a researcher from the African Studies Institute under the Russian Academy of Sciences, thinks that Africans are showing less interest in learning the language as compared to other foreign languages because the Russian government does little to arouse Africans' interest in the language. "And what makes the situation worse," he says, "is largely due to the fact many African leaders have turned away from Russia to Asian countries especially to China." In a media briefing, Artyom Kozhin, the deputy director of the Information and Press Department of the Russian Foreign Ministry (MFA), said "the Russian Federation is successfully implementing programs of cultural and humanitarian cooperation with various African countries, which include contacts in education, science, culture, art, the media, and sport." According to him, these efforts are aimed not only at consolidating cooperation with the African countries but also at resolving key African problems such as overcoming social inequality and the involvement of young Africans in sustainable economic development. "Education is a major priority in relations with Africa. Russian universities are open to African students. Apart from the main subjects they have programs oriented towards key areas of the region's public and economic life," he said further. According to his interpretation, "the importance of specialized knowledge is growing in conditions of globalization and increasing use of information technology. Modern education projects are being created and will be carried out in this context." In June 2001, Russkiy Mir Foundation was created by a decree of Russian President Vladimir Putin to restore Russian cultural image, promote the Russian language and literature abroad, and its activities (operations) are financed under a special state budget allocation approved by the State Duma (lower house of parliament) and the Federation Council. *Kester Kenn Klomegah writes frequently about Russia, Africa, and BRICS. The Meridian International Center has been planning for redevelopment of a plot of land on its 16th Street NW campus for the past seven years. But despite the forward momentum gained this summer, a newly organized group of residents is gearing up with zoning maneuvers in the hope of limiting the project’s size. The advocacy group, called Keep Meridian Hill Green, filed papers in August in an attempt to scale down the zoning for the land, which could present a potential hitch for plans to add a new eight-story, mixed-use building to the parcel directly across from historic Meridian Hill Park. This is just the latest battle in the ongoing saga to redevelop 2300 16th St., an area that’s now a walled-off parking lot with some trees. Meridian has a contract to sell the land to its development partner, Westbrook Partners, which has revised its designs several times over the years in response to neighborhood objections and city input. The latest proposal calls for 111 apartment units, as well as office space and a new conference center for Meridian, a nonprofit public diplomacy [JB emphasis] organization. Meridian says the developer’s building would help fund upkeep of its two campus mansions — both of which are listed on the National Register of Historic Places — while the conference center would fill a need for modern space to accommodate meetings and other events. Meridian made zoning progress with its plans in July despite organized opposition, winning a special exception from the DC Board of Zoning Adjustment (BZA) that allows for some flexibility. 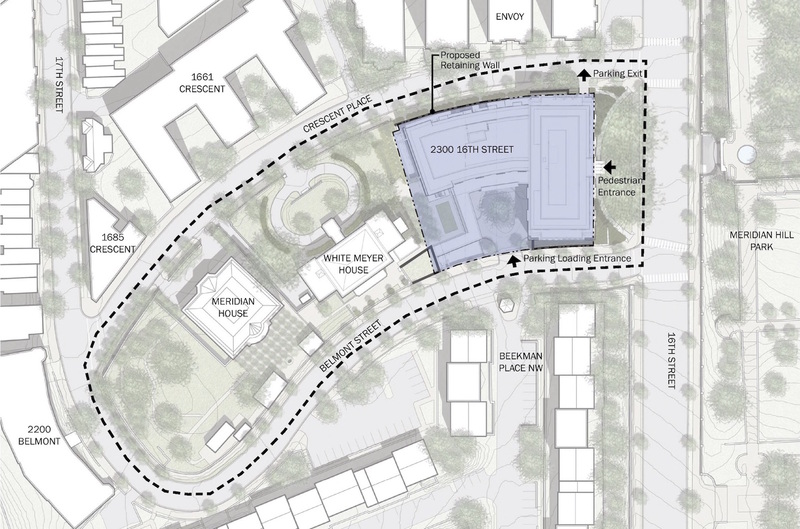 But now Keep Meridian Hill Green has filed a petition with the DC Zoning Commission to rezone Meridian’s entire lot area into an “R-2” designation, which would only allow for buildings up to four floors. The case is awaiting input from the DC Office of Planning. The residents’ argument hinges on a discrepancy between two maps that control DC land use — the zoning map and the Comprehensive Plan’s Future Land Use Map (FLUM). While the zoning map allows a nine-story building on part of the lot, the FLUM envisions only a low-rise development. “According to D.C. law, when a discrepancy like this exists, the FLUM controls and the Zoning Map must be amended,” the petition says. Ward 1 Council member Brianne Nadeau has disputed claims that the project violates the Comprehensive Plan, based on her consultations with Eric Shaw, the director of the Office of Planning. In a letter to an ANC 1C commissioner, Shaw said that his agency and others had verified compliance with the Comprehensive Plan prior to the review by the BZA, even though proceedings there do not address consistency between the zoning map and the Future Land Use Map. As to the project’s impact, Youngblood said that the concerns of his group’s individual members are varied. “Some people are very concerned with tree law and the trees in the area that will be killed or moved. And there are some people concerned with congestion,” he said. The group’s change.org petition had 284 electronic signatures as of Sept. 25. Some in the neighborhood, including Greater Greater Washington contributing writer Jeb Stenhouse, have countered that housing people in a dense, centrally located neighborhood like Adams Morgan is more environmentally friendly than pushing growth out to an auto-centric suburb. 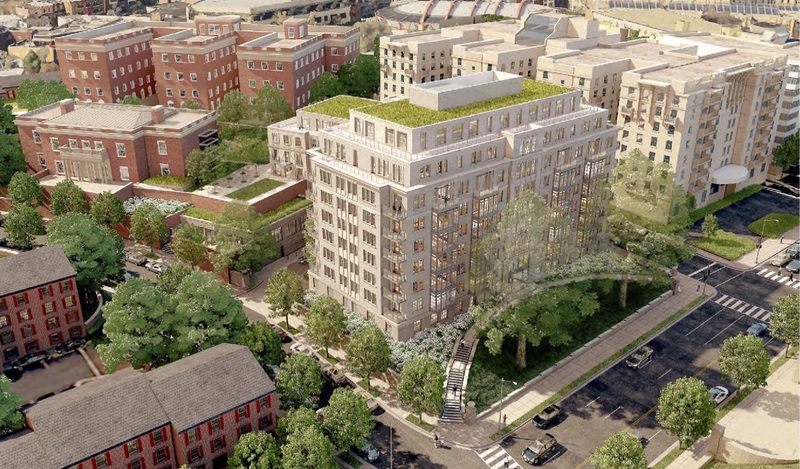 The downzoning proposal has backing from the Adams Morgan advisory neighborhood commission, which has sought to block this development many times before. At its Sept. 5 meeting, ANC 1C passed a resolution supporting Keep Meridian Hill Green’s petition and asking the Zoning Commission to proceed with the case by scheduling a public hearing. Over the years, opposition to the project from residents and the ANC has been wide in scope. In the past the commission has submitted a number of resolutions to the BZA, arguing that the development would negatively impact the noise level, traffic, character and parking in the community. The resolutions adopted by the ANC have also argued that the Office of Planning did not look deeply enough into the impacts of the project during earlier reviews. Ambassador Stuart Holliday, president and CEO of Meridian International Center, emphasized that the project has the support of some community members, noting that agreements are in place between six neighborhood residential groups and both Meridian and the land developer. 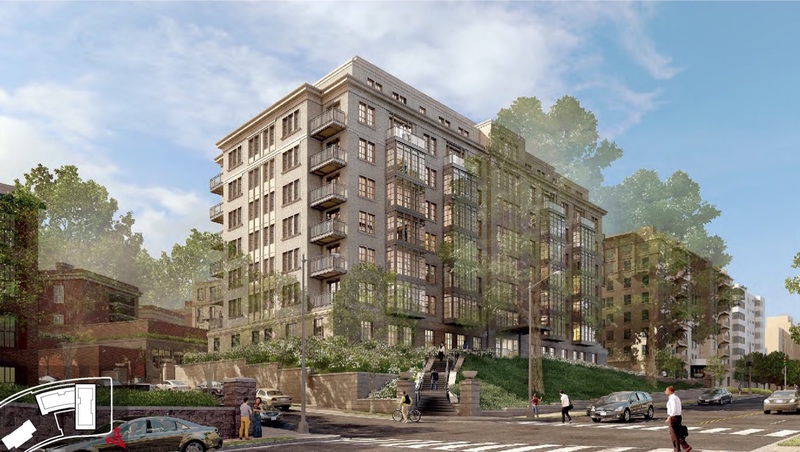 In June, project planners signed an agreement with the Beekman Place Condominium Association, which represents the gated community next to the land in question. Planners committed to routing cars away from Belmont Street, which serves both properties. “Obviously any kind of development or construction is disruptive, and we totally understand that,” Holliday said. “There have been concerns about obviously the traffic and volume of activity that may take place. [But] the traffic studies have been done and don’t bear out the concerns that have been raised.” And some concerns, he said, are based on inaccurate assumptions about Meridian and its plans. While Holliday and others at Meridian were aware of the Keep Meridian Hill Green petition, they could not speak to how a rezoning might affect building plans. 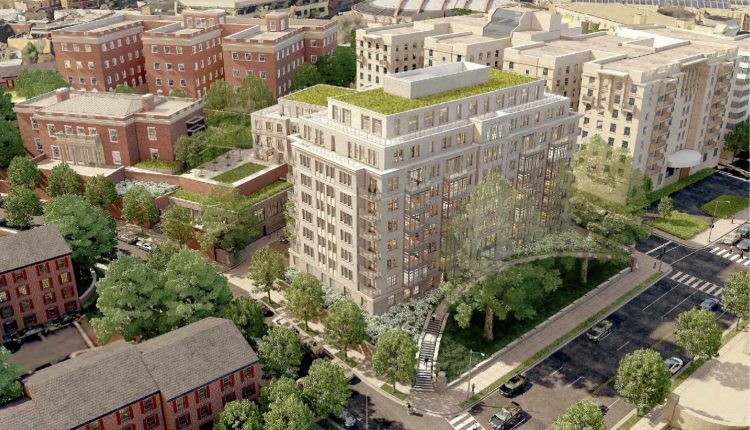 Meridian has already won sign-off from the Historic Preservation Review Board on its architectural designs by Perkins Eastman, which are intended to complement the style of the Meridian Hill Historic District. The Zoning Commission will not decide whether to proceed with a public hearing on the Keep Meridian Hill Green petition until the Office of Planning has weighed in with a recommendation. Am I posing the wrong public diplomacy question?